Featured snippets are organically selected by Google to sit below ads but above all other search engine results. The snippet aims to answer direct questions without having to click through to a page. This places a featured snippet at position zero which means that it will heavily increase the percentage click-through rate. This is usually a sentence or short paragraph of text answering the query that has been searched for. This can be anything from what the time is in Ohio, to why is the sea blue. Exactly as it sounds, this is a video which answers the search query. Almost all of these then link to YouTube. Google decides that a list or table format is the easiest way to display the information, even if that isn’t exactly how the data is structured on the page. Pictures can also go alongside these snippets. With the increase in voice search, a Google Home appliance will not read out all of the search results to your question; the answer will come from a featured snippet. What is the difference between featured snippets and rich snippets? 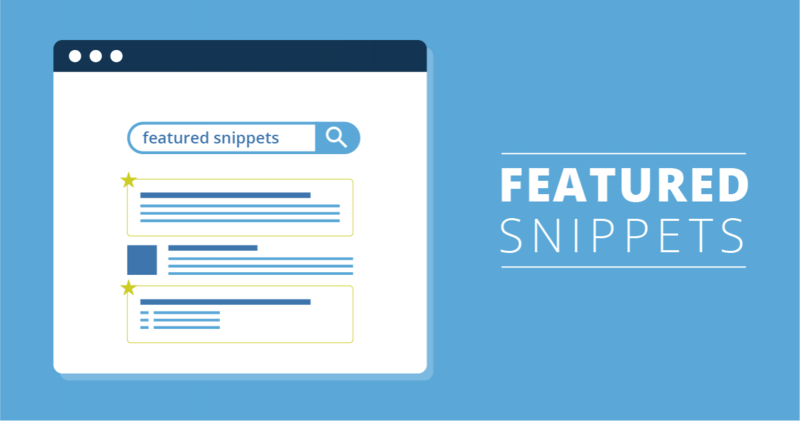 A featured snippet is an answer to query which appears above all other organic research results in position zero while rich snippets are the enhancement of an organic search result. While there is code you can add to your site to tell Google not to show a page from your domain as a snippet, there is no way to force Google to use your page. However, you also don’t need to mark up your HTML specifically for Google to be able to create tables or lists from your content. As you have a chance to become featured if you are ranking in the top 10, a large part of becoming a featured snippet is increasing your overall rankings, specifically regarding informational queries. Research has confirmed that the more words that are used in a search query, the more likely it is that there will be a featured snippet. So, begin with keyword research, but focus on long-tail keywords. Within this, focus on questions and informational queries. Some keyword tools can even help by showing you whether this keyword leads to featured snippets. Google’s ‘People also ask’ section is also a great help for finding out what people are searching for. The easiest way to become a featured snippet is to identify keywords that you are already ranking highly for. After that, you can always look at competitors that are ranking highly or perhaps already have featured snippets, as well as conducting your own research using polls to ask your audience how they would search and what terms they would use. The average length of a text snippet is 45 words with a maximum of 97 words. Even if your article is long-form, to be featured, it is better to ask the question in a header tag and then answer it with no more than a paragraph. You can then expand on this further in the article. Studies have shown that Google loves structured data and would rather show featured snippets with tables or lists. Be sure to label or name your data factually and clearly. If you can ensure your article answers many similar questions, you will be more likely to be featured. To do this, you need to organise and word your content to be able to respond to multiple queries. It might be easier to plan this out before you start writing so you can make search queries into sub-headings and answer each one concisely. As it is not clear how Google chooses an image for a featured snippet, you need to ensure all images on your webpage are eye-catching and would work well if featured. While this is not an exact science, you will learn a lot through the research and optimisation process, gaining new content ideas and how best to structure them so that they are more likely to be seen. Like all SEO, this is not a quick-win, but it definitely has long term benefits for your web pages.